Click image below for utepsecure FAQ page. The UTEP Wireless Information site is here to help you with wireless connectivity to the internet and other resources so that you can stay connected to your world. Connecting to the UTEP wireless network is easy. Stay conneted to your world in a snap! Many vairables are involved when wireless issues occur. Solve your connection problems quick and easy. UTEP offers full wireless coverage in most buildings on campus and also in some remote sites. View the coverage maps for more. 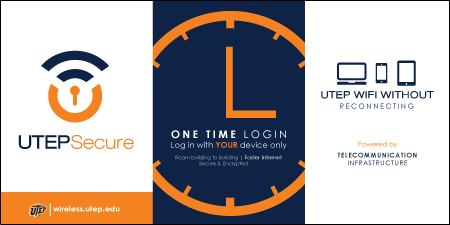 Keeping the UTEP wireless network secure and in peak performance is our highest priority. Have a question about the UTEP wireless network? Get your answer here. We are here to assist you with your wireless needs. Questions, comments, or support...feel free to contact us!